I'm Sue, proud owner of Cottontail Crafts in Settle. I describe my shop as a ‘crafter's paradise’ as I stock an extensive selection of fabrics, knitting, cardmaking, embroidery, felting, haberdashery & much more. The business was started by my parents 60 years ago and I have been a part of it since I was a little girl. There has never been a day when I have not wanted to go to work – that says it all! I love every aspect of the job; chatting to customers, giving advice, making up samples, buying stock, making window displays. I couldn't imagine doing anything else or working anywhere else. I pride myself on both my extensive crafting expertise and my passion for customer service. I’m always looking for opportunities to go the ‘extra mile’ that will really delight my customers. It’s a combination which larger stores find virtually impossible to match. Settle, of course! It is a wonderful Dales Market Town with something to lift the spirits of everyone; quality, independent shops, great places to eat & drink, marvellous heritage, stunning scenery, fascinating places to explore, excellent places to stay and many things to see & do. Easy! Sewing, knitting & crafts in general. I also love going for walks in the hills around Settle and spending time with my young grandchildren. On their first day I would urge them to take a ride from Settle on the Settle-Carlisle Railway and enjoy the fantastic views of the Yorkshire Dales from the comfort of a railway carriage. I would suggest they get off the train at Ribblehead and explore the famous viaduct set within a stunning landscape. At the Ribblehead Visitor Centre they could find out how the viaduct was built and how the workforce lived in this remote location. On their return to Settle I would happily recommend that they visit any of the town’s inns, cafes and hotels for a drink, a bite to eat and a sample of famous Yorkshire hospitality. In the evening, I would suggest that they book a ticket for a performance at Settle’s Victoria Hall, England’s oldest surviving Music Hall. On their second day I would suggest that they try and ‘bag’ at least one of the Three Peaks – Ingleborough, Whernside or Pen-y-ghent and then reward themselves with a memento of their achievement, available from various outlets in the Dales or on-line. 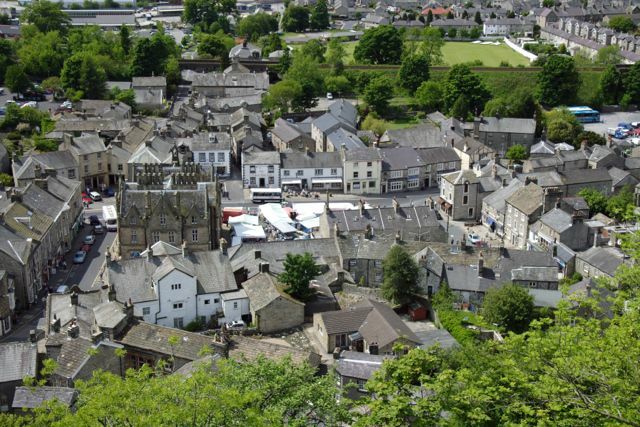 I frequently experience feelings of swooping joy when I’m walking in the hills that surround my home town of Settle. I especially enjoy the walk that climbs high above the town and then takes me past Attermire Scar, Victoria Cave, Jubilee Cave, Winskill, down to Stainforth and then back to Settle alongside the River Ribble. I often stroll along Settle’s Riverside Walk and love spotting elusive dippers and kingfishers. On a sunny day I love sitting on the top of High Hill from which there is a stunning, panoramic view of Settle, Giggleswick, Pendle Hill, the Bowland Fells, Ingleborough, Pen-y-gent, the River Ribble and the Settle-Carlisle Railway. W R (Bill) Mitchell is the person I think most embodies the Yorkshire Dales spirit. Bill was born in Skipton in 1928. He began a long journalistic career at the Craven Herald and then moved to The Dalesman Magazine which he edited for many years until his retirement in 1988. Bill spent many years recording the lives of Dales folk in their own words. He has been president of the Yorkshire Dales Society, a charity which protects, conserves and promotes the Yorkshire Dales, for 25 years. There's an archive of his work at Settle Stories. Reverend Benjamin Waugh (1839 - 1908), the founder of the NSPCC, was born in Settle.